How cool are they? 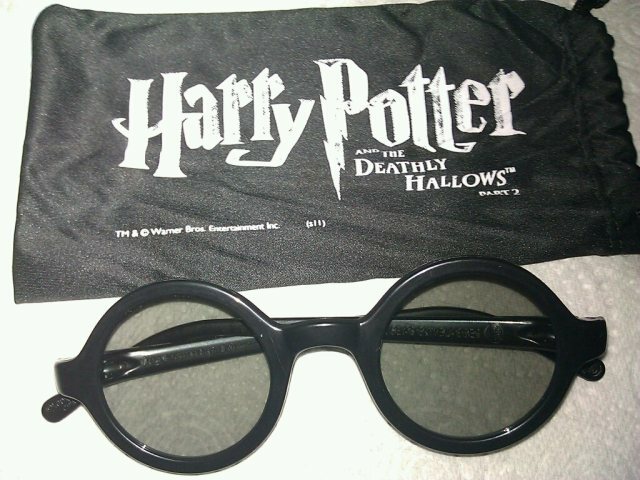 Harry Potter shaped glasses!!! And what made it even cooler (to me) was that they're Cineworld exclusive glasses which I picked up a few weeks ago and we were in a Vue cinema and as such I WAS THE ONLY PERSON WEARING THEM. Epic. :) If only there had been some 3D to actually appreciate... so yeh, post-production 3D conversion = rubbish, it just doesn't work and it's rubbish. Do NOT pay the extra to watch it in 3D although if you do it won't ruin the film at all, but you're actually just wasting your money! Still a few bits were done rather well and the scenes with the dragon springs to mind here (yes there's a dragon in the film so sorry if you find that to be a spoiler!). If anything these 3D conversion films are actually ruining the 3D market because people think that's as good as 3D can be and it's really not. Transformers 3 was a brilliant example of 3D that really worked, because they didn't try to throw it in your face (well for 99% of the film anyway!) and it was just there as a bonus, not a requirement. But anyway, enough about the rubbish 3D and back to the actual film! It carries straight on from where the first one left off and although the first 5 minutes felt a bit slow, it soon sped up and within *20 minutes* we've already been to Gringotts and we're back at Hogwarts! Please don't misunderstand though, although in the book that's a heck of a lot of pages and in ways Gringotts does feel a little rushed, what needed to be done was done and it gave more time to Hogwarts which is where most of this film is set. Back at Xmas 2009 my parents bought me a gold coloured NeoCube for one of my presents and I've had many fun hours since then playing with it and making things out of it. 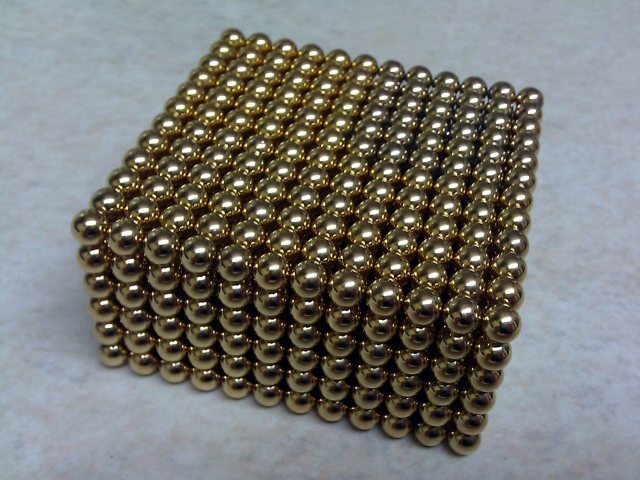 If you're unfamiliar with it, they're simply 216 magnetic spheres that originally form a cube (6x6x6), but you can shape into loads of things as they're incredibly magnetic. So much so that you have to actually be really careful not to get it too close to anything electronical incase you fry it! You can see my original cube in the top-right corner, it's slightly discoloured after 18 months of heavy use, but they're all mixed together now and you can't really tell them apart. 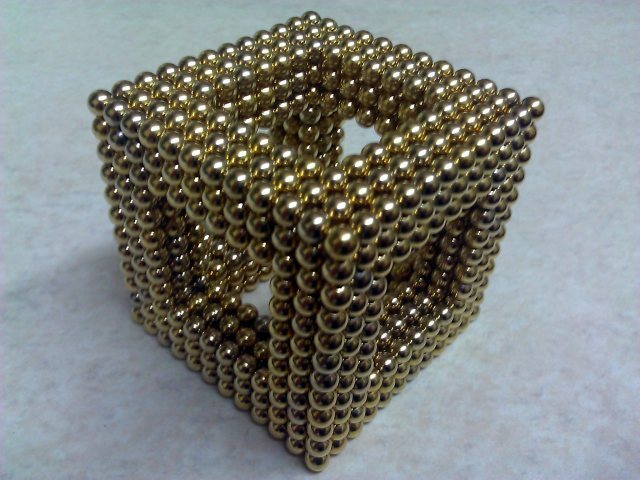 Four cubes is 864 spheres and it's actually pretty heavy! I've got the smaller "classic" size so each sphere is 4.76mm big so whilst the picture might look quite big, the actual thing really isn't. In fact, unless you're looking at this on a mobile device, the picture is going to be at least twice the size of the real thing!